I enjoy reading about alchemy and I love the books of Mircea Eliade. So how does it come that I did not read Eliade’s book about alchemy? Time to fix that! 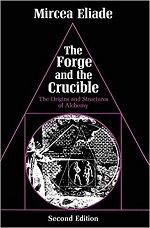 The Forge and the Crucible is a relatively small book which is based on a paper that Eliade wrote as a student. In the second edition Eliade did not rewrite his book, but he did add a (not too interesting) essay on the latest developments in the research in the field. Eliade’s book on “The Origins and Structure of Alchemy” (the subtitle) is not your usual book about alchemy. It has not many fancy images and does not try to explain alchemical symbolical drawings. Rather, Eliade approached the subject as a “historian of religions”. So he starts with religious views on meteorites and metals, continues with smiths and and metal-working in the iron age and only slowly works towards the period which most books about alchemy are about. Eliade collected information of a vast number of “primitive” societies and their metal-workings, offerings to the furnace and trance-induced visions. Smiths, warriors and eventually initiation. A few short chapters are dedicated to Chinese and Indian alchemy and of course you will read about Western alchemy as well. The Forge and the Crucible is very much an ‘Eliade book’ and will make an interesting read to people who enjoy the author, but also to those who like another take on the subject.